Season: Mostly fall, occasionally in the summer. Edibility: Edible with caution, if not entirely delicious. Defining characteristics: Reddish hairy cap, yellow pores, a veil that may not completely disappear with age, found predominantly near eastern white pine. 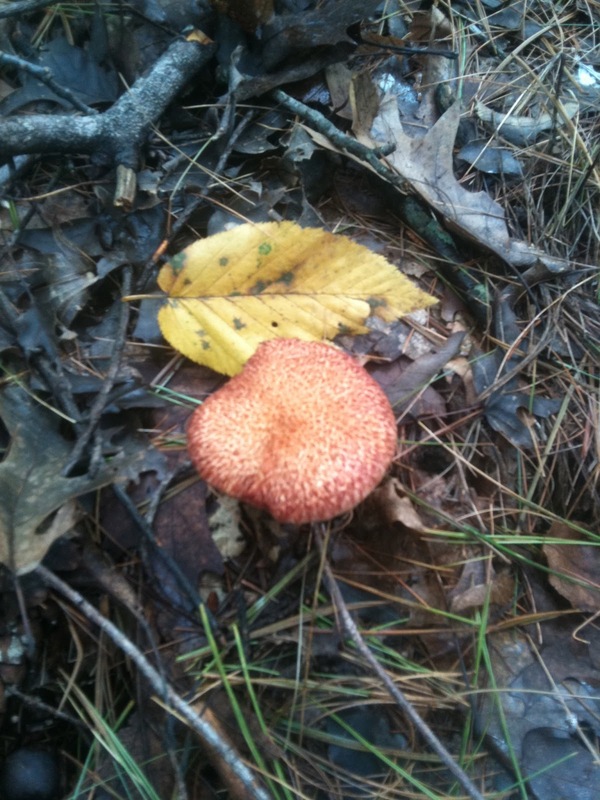 Sometimes confused with: Boletes and Suillus are a complex group of mushrooms. While there are many tasty boletes out there, and most are not dangerous, there are some poisonous ones to watch out for. My advice is to take it slow with the boletes, go steady for a while before you get real serious and make a permanent commitment. Painted boletes strutting their stuff. and the remnant veil on the right. The painted bolete is one of the most recognizable and attractive suillus. Suillus are a group of ~50 species in the larger grouping of boletes. (Genus Suillus within the order Boletales if you want to get taxonomic). Suillus are distinguished by generally being found near conifers, having a veil covering their largish pores, and being rather slimy (in addition to the primary characteristic of being a pore bearing mushroom instead of gill bearing). The painted bolete fits most of those criteria, except it is generally not particularly slimy, a feature that I appreciate. They often appear in fairly large numbers, and I have only ever seen them around white pines here in Rhode Island. They tend to become infested fairly quickly with bugs, so select prime specimens! If you are a novice forager, I would exercise caution before eating any bolete. You can probably get away with it, but a mistaken ID could leave you under the weather for a while, or more likely, with a horribly acrid taste in your mouth for a long time (yes this has happened to me). Often when trying to identify your bolete down to the species one of the final tests is to take a small bit into your mouth, chew it a couple times and spit it out (I normally rinse my mouth out afterwards with a shot of vodka- I figure it helps sanitize any critters, and helps me out to boot). This allows you to tell if there is no taste or an acrid or bitter taste. If it taste bad raw, it is probably not going to taste better after cooking (although there are some exceptions to that rule). Painted bolete in the woods. Please note that you should only do this taste test after narrowing it down to a group of non-poisonous mushrooms, and you should spit out everything you put in your mouth. Eating raw mushrooms is not recommended, period. Too much bacteria, virus, and animal poop hangs out in the woods to risk raw consumption, not to mention that our bodies are not equipped with the ability to digest raw mushrooms. I personally am not a huge fan of the painted bolete as an edible. After sautéing it pretty hard in butter and oil, and seasoning it well it taste all right- but at that point you have pretty much made a mushroom fry, and what doesn't taste good fried and salted? My wife thinks they are pretty tasty though, so don't take my word for it. As usual, for better information and advice on this species I encourage you to read the following: Mushroom Expert, Taste of the Wild, or Wikipedia.